Even before its formal groundbreaking Monday, work is well underway on the $50 million Georgia Cyber Innovation and Training Center on the Augusta University Riverfront campus. The mission of the center – to provide cybersecurity education and training to students. 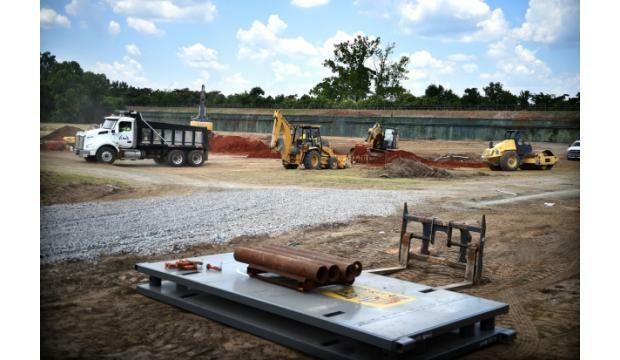 and a wide variety of workers – has also begun and is taking shape as well, said Calvin Rhodes, executive director of the Georgia Technology Authority tasked with building the center. Gov. Nathan Deal, who has championed the center, and other officials will gather at 10 a.m. for the ceremony, which will also include an announcement about a new partnership between AU, the state of Georgia and a partner to be named at the ceremony, he said. Much of the planning of both the exterior and interior of the 159,000-square-foot building has been completed, Rhodes said. That would connect the building to what Rhodes envisions will be an extension of the current Riverwalk Augusta. Planning for the $12 million, 575-space parking deck is also complete, and the state and the city of Augusta are working out the details to manage the deck, which may go before the Augusta Commission this week. The current work is proceeding quickly because of excellent cooperation from agencies, particularly the city of Augusta, which granted land disturbance permits in “record time,” Rhodes said. “The partnership there has been tremendous, which has allowed us to go ahead and start doing several things early,” he said. Most of the grading and underground work with utilities and storm drains is underway and should be done by July 26, with concrete pouring of foundations and footings to begin soon after, Rhodes said. The building has a very quick schedule after that, with steel going up in September, the shell of the building completed by Jan. 31, with drywall starting in February. The building is scheduled to be completed June 21, 2018, and open July 10, 2018, he said. Much of the interior design has been done in conjunction with AU, which will manage the day-to-day operation of the center, and other partners that will be housed in the building, including the University System of Georgia, Augusta Technical College, the Georgia Bureau of Investigation and the Georgia National Guard, Rhodes said. Those agencies and the Army Cyber School have also been involved in working groups to shape the training and curriculum that will be offered both in and through the center, he said. The goal is to “stand up programming that it is going to fit well together,” he said. The authority has already launched the Georgia Cybersecurity Workforce Academy to begin that training, Rhodes said. The academy “will train state and local government computer security officers on how to better do their jobs, and sharpen their skills, and learn new skills,” he said. “That’s something that our agency and the executive branch of government will benefit from on day one. The large cyber range within the building, one of only a handful in the country, will be a major site of training and learning once the building is completed. AU Cyber Institute, which has a small cyber range now, will be located within the building as well.